A Family or a Crowd? Manassas, Virginia attempts to resolve overcrowding issues not unlike those in Allston and Brighton. "One 23-year-old Mexican told The Palm Beach Post a couple of years ago that he, too, thought 10 unrelated workers living in a two-bedroom apartment was too much. "Eight people — three in each bedroom and two in the living room — that should be the maximum," he said. This is the problem in Manassas. When crowding becomes commonplace, neighborhoods change. Parking disappears, and mountains of trash appear on the sidewalk on collection day." Cofiroute is a company building a major tunnel in France to move traffic off city streets and reduce traffic congestion. The project's motto is: "Drive safely underground, life better above ground". And Europe also has The Channel Tunnel (Chunnel) connecting England and France. As Harvard contemplates undergraduate housing along the Charles River near the football stadium and putting parts of Soldier's Field Road underground, it is interesting to also think about these other tunnel projects. See the Cooper Robertson & Partners Interim Report for more info about options for a basic campus and urban framework in Allston. For Honan, the failure is a sign that the neighborhood should get a sturdier (and far more expensive) reinforced sound barrier fence to keep both noise and snow out. "There are other communities that are supposed to be ahead of us on the list, but we need to pass them now," said Honan, who added that the Turnpike Authority will be meeting with the neighborhood in mid-March. "We deserve much better than this." A typical Cambridge household using 500 kilowatt hours per month in 2005 paid NStar $70.71. Read more at www.massmunichoice.org to read about a bill at the State House that could help us pay lower electric bills and have better customer service. Shivering a little as snow fell on Uphams Corner in Dorchester yesterday, a lanky 15-year-old in a black-hooded parka began sweeping dirt and candy wrappers and scraps of crumpled plastic off Dudley Street. Anderson, who lives in South Boston, has spent the last five Saturdays traveling around the city in a van filled with brooms, shovels, and about 10 other youths, filling brown plastic bags with litter as part of a new Boston city winter jobs program. Sounds like a great program. I hope Harvard St will be on their itinerary. New York works on an issues that we can relate to in Allston and Brighton. In an unusual pairing of business and environmental interests, five neighborhood business groups are asking the Bloomberg administration to do more to relieve congestion on city streets, citing a new study of private car traffic in Manhattan...it proposes a series of steps long advocated by transportation planners: dedicating more space on the streets for buses and bicycles and freeing more sidewalk space for pedestrians. After Summers - The Boston Globe: "the seeds that Summers planted in Allston have the potential to move the Massachusetts economy ahead for generations." Harvard University President Lawrence Summers has resigned after a turbulent five years of leading the prestigious school. What will this do to Harvard's Allston planning? Today's New York Times has an interesting full page adverstiement from the Piaggio Group, the company the manufactures Vespa scooters. The ad listed some environmental benefits of scooters (reduced fuel consumption, reduced emissions of carbon monoxide and carbon dioxide). Boston could consider how it might make Boston more friendly to people riding scooters, bicycles, and people who use car sharing programs like Zipcar. In addition to being cheaper than owning a car, all of these options would reduce parking shortages in our neighborhoods and scooters and bicycles would reduce traffic congestion too. If the demand for on-street parking was reduced fewer people might want to pave and park in their front yards. Can Boston install more bike racks, places to lock scooters, encourage Zipcars at more locations, and build more bike lanes or otherwise design roads better for things other than cars? A compensation review committee appointed by the mayor is probably going to recommend later this spring that salaries for the mayor and the City Council -- now $150,000 and $75,000, respectively -- be hiked by an amount to be determined. Boston councilors are also relatively well paid, according to the National League of Cities. A 2001 survey found the average salary for councilors in cities with populations of 200,000 and up was $39,061. Friday was a big day for bold vision on the other side of the city, too, as Harvard University joined Menino in unveiling plans for the first building in its long-anticipated new campus in Allston: a 500,000-square-foot science complex with a state-of-the-art stem cell laboratory as its centerpiece. Community leaders in Allston seemed a good deal more impressed with Harvard's move yesterday than were some passers-by on Federal Street with the city's. If it's green, or could be, it's on the agenda for the second annual Allston Brighton Green Gathering Thursday night at the EF International Language School. Allston Brighton Green Space Advocates is a year-old confederation of local groups and individuals who want to maintain green spaces of all shapes and sizes. Saying they wanted to avoid the sort of influence-peddling scandal that is rocking Washington, New York City leaders yesterday proposed a set of strict new limits on lobbyists that would bar them from certain areas inside City Hall at certain times and severely limit their ability to shower officials with gifts and campaign donations. Is Boston moving in the same direction as New York? As concerns of development and Allston's future mount in the community, Boston College unveiled its plans for the college campus in two neighborhood meetings last week. A neighborhood charette will be hosted by BC on Feb. 25, 9 a.m. - 12 noon to gather public input and continue the master planning process. Many promises and $200,000 later, a new snow fence built by the Turnpike Authority shielding Lincoln Street from the Massachusetts Turnpike came down in the last snowstorm. Area residents who had asked for a stronger fence in the first place are upset. After a graffiti spree in Allston-Brighton last March, Tyson Andree Wells, 26, of Brookline pleaded guilty last week to vandalism charges. A two-year impasse was broken Wednesday as the Boston Public Schools and the teachers union reached an agreement on a three-year proposal regarding pilot schools. In Brighton, this is cause for celebration, as the Thomas Gardner Elementary School on Athol Street has long awaited pilot status. Harvard University plans to build a 500,000 square foot complex for stem cell research and other science initiatives in Boston's Allston section. Harvard has chosen a German architectural firm, Behnisch Architects, and a site for the complex, which will house the Harvard Stem Cell Institute. 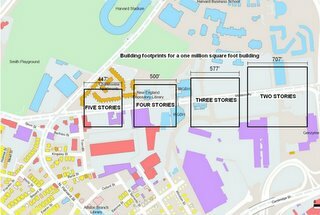 Several other cross-departmental science initiatives also will be housed at the site on Western Avenue, east of the intersection at North Harvard and next to the studios of public radio and television broadcaster WGBH. Harvard hopes to break ground on the new building in 2007. In other related developments, Harvard will soon propose an alternative site to Charlesview for their possible relocation. The new potential site tries to address criteria set forth by Charlesview. Behnisch Architects were the architects for the new Genzyme building in Kendall Square. Bostonians may be used to getting slapped with fines for illegal parking. But bad behavior will soon cost city residents, too. Armed with new citation books, police are to begin issuing tickets for scores of transgressions of city ordinances: from loud, late-night parties and improperly stored trash to posting handbills in certain public places and using laser pointers in public. The tickets, carrying fines of $10 to $300, are the latest in a series of crime-fighting moves mounted by the city, as officials seek solutions to a wave of violent crime. Allston-Brighton break-ins on the rise - The Daily Free Press: "Residential break-ins in Allston-Brighton are on the rise along with the crime rate because of the growing number of students seeking housing in these areas"
Story about changes in the Allston music scene at Harpers Ferry and O'Brien's. How big is 1,000,000 square feet? 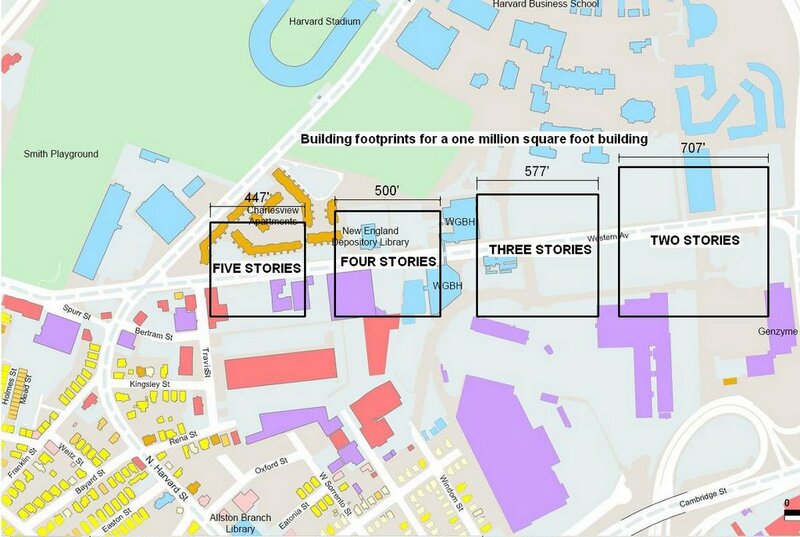 Some estimates of Harvard's plan for expansion in Allston have mentioned creating one million square feet of new space. How much is that? This shows the footprint of a million square foot building based on various building heights. Some of this space could be built underground, and Harvard is going to build several buildings, not one, but hopefully this provides some context. Allston residents are blaming the penny-pinching Turnpike Authority for building a flimsy fence blown down during last weekend’s blizzard instead of the stronger wall they wanted between their neighborhood and the roadway in the first place. Nationally, the homicide rate peaked in 1991, declined steadily after 1993 and has remained essentially flat since 1999. But in the first six months of 2005, according to preliminary statistics from the F.B.I., the number of homicides nationwide rose 2.1 percent, with the greatest increase, 4.9 percent, in the Midwest. Yet many cities have seen far steeper increases. In Boston and San Francisco the number of homicides last year was at its highest in a decade. But the police also blame lax sentences and judges who they say let suspects out on bail too easily..."We have people who've done two, three, four, five shootings who are back on the streets," said Kathleen M. O'Toole, Boston's police commissioner. "Unless we have bail reform, unless these impact players with multiple gun arrests are kept off the streets, we won't reverse this problem." TownOnline.com - Local News: Center doors slammed: "Disappointed residents at a community meeting last week protested St. Elizabeth's taking away a senior day-care center that is scheduled to close April after 20 years of serving the neighborhood." All meetings are scheduled to be held at 7:00 p.m. at the Honan-Allston Library, 300 North Harvard Street. Meeting dates, time, and location are subject to change. Menino mounts new push for WiFi - The Boston Globe: "A campaign to build a wireless data network in Boston picked up momentum yesterday as Mayor Thomas M. Menino said he would mount an effort to spread wireless Internet access across the city." Harvard Business School has raised nearly $600 million in a multi-year capital campaign that will fund student financial aid, faculty recruitment, technology initiatives, new global research centers, and building projects on the school's campus along the Charles River. And for campus renewal, it raised $85.7 million, compared with a goal of $80 million. The story doesn't mention that HBS is in Allston, but this will be another interesting piece of Harvard's activity here. Allston & Brighton Need More Voters! Did you know that Allston and Brighton come in LAST in voter participation in Boston? Only 46% of our residents are registered to vote. This is the lowest % in Boston. The citywide average is 60% and some communities have more than 70% registration. Only 24% of our registered voters actually voted in last November's election. This is also the lowest % in Boston. The citwide average was 36% and some communities were as high as 48%. So only 11% (7,139 out of 65,561) of the residents of Allston and Brighton voted last fall. In places like South Boston and West Roxbury more than 30% of residents voted. How much better would our community be if our turnout matched the city average of 21%? BU's Daily Free Press does a nice story about Allston Brighton 2006. Change legal occupancy from 2 family to 3 family. Legalize existing first floor unit and extend into basement. Nearly snowless city still needs a sweep - The Boston Globe: "Appalled by the piles of potato chip bags, pizza boxes, Dunkin' Donuts cups, and general grit and grime he has been seeing day after day, Councilor Jerry P. McDermott of Brighton says the city needs a serious cleanup." Watch city government in action! In the Feb 1 hearing you can watch debate about guest permits for resident parking areas and many other Council hearings that will be coming up. Overdevelopment - Coming soon to your neighborhood? Allston-Brighton TAB: Neighbors ask, is it legal? Owners of the yellow one-family house at 28 Adamson St., Allston, are trying to sell the parcel, with a permit pulled Jan. 10 for five, three-bedroom units, a move that goes against the Allston zoning code. "This person is deliberately taking advantage of what they hope will be a zoning loophole to make money," said local lawyer and neighbor Cathi Campbell at a community meeting on Saturday. The lot is zoned three-family and can house only three units, but the developers plan to get around this requirement by building a three-story row house with five condos inside. Story from the Globe about yesterday's Democratic caucuses and here is a more local point of view. "Ward 21 (Brighton/Allston) we had 14/18 delegates for Patrick and 2 alternates for Patrick. This was the direct result of Patrick's ward 21 organizers getting a strong turnout and being very well organized. " This site has several different email lists you can join to learn about Snow Emergencies/Parking Bans, School Closings, neighborhood specific meetings, youth events, and more. Open Monday through Friday and located in the lower level of St. Gabriel's Church on Washington Street in Brighton, the Adult Day Health Center was begun in 1981 to meet local needs of senior daycare. It offers a wide range of specialized services to people who have mild to moderate physical impairments and who need assistance in maintaining or improving their level of independence. The center is scheduled to close in April and currently serves about 28 seniors. This is an interesting website for property transactions and research. Select "Suffolk" county then Property Search. The database contains deeds, mortgages, liens, and other records of property transactions. Channel 7 News Team helps get a crosswalk light repaired in Allston. If you live in Boston and spot a broken traffic signal, you can call the mayor's 24 hour service line to report it: 617-635-4500. You can reach Hank Phillippi Ryan, 7 NEWS investigative reporter through this web site. New York hires a executive director of retail development to assist neighborhood organizations in their efforts to attract and retain a diversity of businesses that serve local residents.